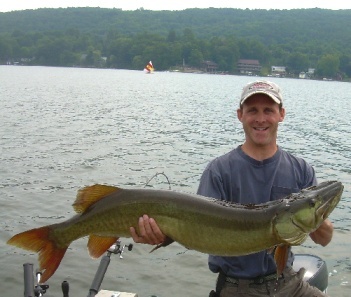 Mark Moskal, owner of Summit to Stream Adventures, has been guiding groups seeking adventure in the Finger Lakes Region of NY for chartered fishing, hunting excursions, and kayaking tours. Captain Mark is also the guy to go to for finding the natural wonders, such as waterfalls, around the lakes for over fifteen years. I wrote a post last year about waterfalls near Seneca Lake and included a link to Mark's post about waterfalls in the area. My guests love a day trip out to Watkins Glen State Park , Taughannock Falls State Park, or Buttermilk Falls State Park. All of these state parks are within a thirty-five minute drive from 1922 Starkey House Bed & Breakfast. Usually, my guests stay in the area two to five days. There are so many beautiful things to see and do besides visiting the region's many wineries. Captain Mark will help you plan a kayak tour or charter a day fishing, including great fly-fishing that will make the best use of your time while here. Just call ahead to 607-535-2701 and arrange your charter or tour. The late spring and summer months fill fast so plan ahead.